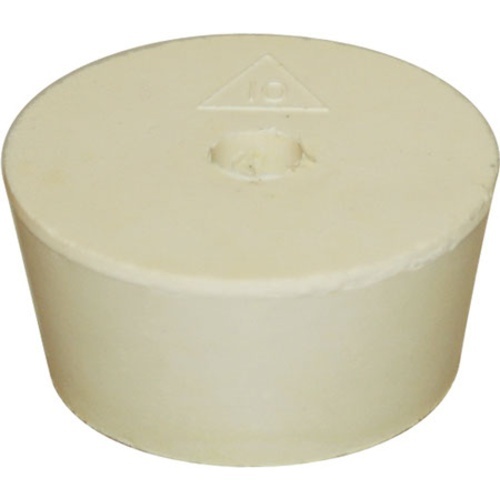 This stopper measures 1 11/16" - 2" in diameter from bottom to top. The #10 stopper is generally used with our 3, 5, and 6 gallon plastic carboys. Goes with 7 gal carboy. Solid rubber instead of the one size fits all type. Wanted a stopper to seal the Fermonster 3 gallon carboy when not in use. Because it was presented as an option when buying the FerMonster and it was easy to add to cart. No other reason. Works great with my FerMonsters. Make sure you put it in while lid and stopper are both DRY and works great. It fits a 3 gallon better bottle. It fits the fermenter Ihave and the one I just bought. I didn't have one to fit my plastic carboy. This stopper fits the Fermonster carboy. As a backup Incase the PET closure doesnâ€™t fit. Itâ€™s simple and serves well. The stopper material is very soft and is perfect for use on the Fermonster, no leaks and a tight seal. MoreBeer has another stopper, FE470VS, that does not work well with the Fermonster. Perfect fit for my better bottles! About all I can say about this stopper,it's as good as they get. This is actually stickier than all my other stoppers. So, unlike my other stoppers, it doesn't slip out of the hole. I use Fermonsters for both primary and secondary. No more fiddling with a slippery stopper or having to sanitize it with vodka just to make it sticky. Thanks, Morebeer! fits my variable volume tank, much better than the vent with a marble in it. i use it with a curved tube on top. Best Stopper on the Planet! Yup...it's a stopper. Strange I would be asked to review it. It works. All I can ask for. It’s a stopper. It’s fine, but these don’t fit quite right in my 6 gallon carboys. They pop out unless I jam them in so far that I need a tool to get them out. Ok doesn't hold seal that great. I use this stopper on my Fermonster carboy and it works great! Fits my carboys and seals out the germs. Airlock fits snug. No problems. Does exactly what it is supposed to do, and what you'd expect it to do. These are a must have for Better Bottles. They can push pretty far down into the mouth of the carboy and become difficult to get out. It would be nice to have a lip around the top of the stopper to prevent it from going too far down and to give you something to grab hold of to pull it out. Great for 5- and 6-gallon PET plastic carboys! I use PET plastic carboys, and these stoppers make a great seal. They are easy to clean and sanitize. They are very durable as well. I love these stoppers. These are not the best choice for carboys, they'll push right though. I'm going to try the 10.5 and see how that works. They will do the job, just not sure how I'm going to get them out. Works great for Better Bottle and also bought the #000 stopper to make this into a solid stopper when not using an airlock. Works with pet better bottle without popping out or dropping in. This does a great job of fitting tightly into a PET neck. It won't pop out, but it's also easy to remove with a firm tug. However, the first time I used this I thought something had gone horribly wrong. I smelled the beer before racking and it had an awful rubbery smell. This, it turns out, was just a lingering aroma of the bung that did not affect the beer at all. However, I like to smell my beer in the fermenter before racking, since aroma can sometimes tell you that a beer needs more conditioning (diacetyl, for example) and the rubber smell of this stopper completely overshadows any other odor. I'm thinking about silicon or plastic replacements. got a big bottle opening? use this. A good product, fits well on 2l flask if needed. This stopper works great with my 6 gallon carboy. The airlock and blow off tube both fit great with the stopper's hole. I use this with an airlock for my starters. Easy to clean, stain resistant and doesn't break down. Probably not the most exciting piece of gear, but does an admirable job of capping a PET carboy. This fits my 6 gallon PET carboys perfectly...I say this because I got conflicting comments on this from different sources. A 10.5 is too big and pops back out easily for some reason. Highly recommended. I like these better than the universal stoppers. These hold a tighter seal throughout fermentation. I use this with my beer gun to fill growlers without foaming. Also fits 2L flask for brews. Been using this for a months now with no issues, it has never popped out like some other stoppers that use cheaper rubber. I bought this for my 2000ml flask and is a perfect fit. It enables me to use an airlock for my yeast starters.